Three of the five men charged with obstructing a peace officer during the October 2, 2015 raid on Glencolton Farms comprised the defence at the trial that began in Walkerton on March 6, 2017: Robert Pinnell, Michael Schmidt and John Schnurr, each representing himself. Robert Pinnell was acquitted during the second week of proceedings and the trial was adjourned on March 23 until additional dates and court space can be arranged, to be finalized on April 12. It is anticipated that another three days will be needed, the judge’s ruling to be handed down thereafter. 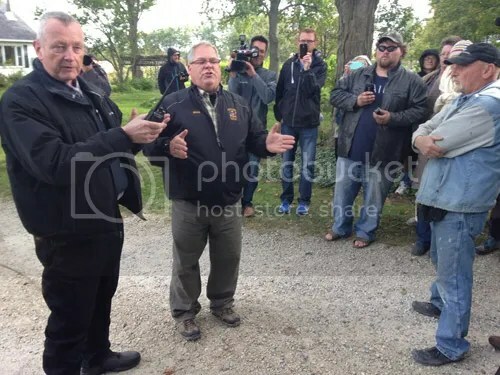 Ken McPherson, formerly a detective with the West Grey Police, addresses the crowd at the standoff October 2, 2015, from which the obstruction charges, now being tried in Walkerton, are related. Six weeks after the standoff at Glencolton Farms on October 2.2015 five arrest warrants were issued. As a result Michael Schmidt, John Schnurr and Robert Pinnell turned themselves in at the West Grey Police Station. They got arrested, fingerprinted, mug-shots were taken and then they were released. Enos Martin a local farmer never got notified. They violently arrested him three times on the same charge, twice on the same day and a third time weeks later in front of his crying wife and young children. He ended up in hospital filed a complained to charge the officers for assault. His charges got dropped. The arrest warrant for George Hugh Bothwell was made public by West Grey Police in the Owen Sound Sun Times. No success. A facebook page FIND GEORGE achieved only humorous postings and George Hugh Bothwell was not to be “found”, despite Geo happily living and farming at home. Ken McPherson is the West Grey Detective in charge of investigating the failed spy camera affair, was in attendance as a peace officer at the raid October 2. 2015. He laid the charges and issued the arrest warrants for the 5 accused. The trial of the five people charged in relation to the raid on Glencolton Farms on October 2, 2015, continues Monday March 13, Tuesday March 14th, and Friday March 20th of this week and also next week Monday March 20 in Walkerton. So far the court has only heard from the first witness of the crown, Glenn Jarvie. Michael is still cross examining him and will continue to do so for a good part of Monday. There are several more crown witnesses to testify and be cross examined. Then the defense will bring in their witnesses and the crown will have a chance to cross examine them as well. Supporters of food freedom, or anyone interested in the case, are welcome to come to Walkerton to observe the trial in progress. For more context, see last week’s story. Word from the farm is that Michael has fallen sick, and so has gotten sick leave from court for two days. The trial is postponed until Thursday, March 9 and will go until March 10. Michael is uncertain how far we will get, if at all, as fitting a five-day trial into two days seems a bit far-fetched. For those of you who did not know, this trial is for the obstruction charges relating to the October 2015 raid on the farm. Supporters are encouraged to attend the trial which will be in Walkerton, now on March 9th and 10th. March 3 2017—Ontario, Canada— EIN Presswire — A highly anticipated drama will unfold in the Walkerton Courtroom starting Monday, where Glencolton Farms coop owners will re-live the dramatic stand-off at the farm where they source their food. On Monday, March 6, 2017 at Walkerton (County of Bruce) Courthouse in Ontario, 207 Cayley Street, 3 farmers and a colleague face charges of obstructing police officers during a farm raid. The trial is set to begin at 9:30am. 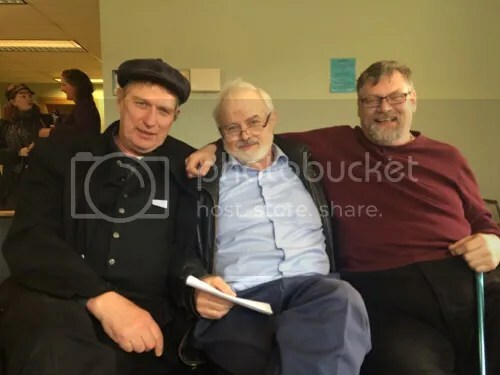 The four men on trial are Michael Schmidt an outspoken activist on food rights who lives on the farm that was raided; Robert Pinnell, farm hand and mechanic; John Schnurr, business consultant; and George Bothwell. The four men, along with a fifth whose charges have since been dropped, were charged with obstructing a peace officer during a well-publicized raid on Glencolton Farms on October 2nd 2015. Glencolton Farms has been the center of the Canadian raw milk battle for over 23 years. Glencolton Farms is owned by 150 families who are members in the Our Farm, Our Foods cooperative.